Pain plays an important role in alerting the body to potential tissue injury and drives behavior that protects the body from further harm. In contrast, chronic pain does not serve this function and instead only provides a persistent sensation of pain and a negative experience. The mesolimbic dopaminergic system has been recognized to play a central role in motivated behaviors, including various types of reward and pleasure. Many dopaminergic neurons may release multiple neurotransmitters, and the physiological role of the co-release of these transmitters has been revealed incrementally. However, it was not yet clear whether the mesolimbic dopaminergic system and small molecules released in the nucleus accumbens (N.Acc. ), the input region of mesolimbic dopaminergic neurons, are involved in pain modulation. Recently, we revealed that the mesolimbic dopaminergic system and small molecules released in the N.Acc. 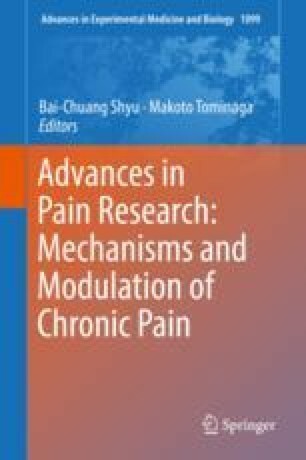 could contribute to pain modulation. In this review, we provide an overview of the relationship between pain and the brain reward circuit using a combination of optogenetics, electrophysiology, and in vivo microdialysis/mass spectrometry integrated system. This work was supported by MEXT-Supported Program for the Strategic Research Foundation at Private Universities No.S1411019.